In the world of healthcare conferences, there is one event that outshines the rest when it comes to utilizing social media. Medicine X, Stanford Medicine’s premier conference on emerging health-care technology and patient-centered medicine was attended by more than 650 people and watched via live webcast by several thousand more. Over the course of the three-day event, more than 48,000 tweets, using the hashtag #MedX were sent out. 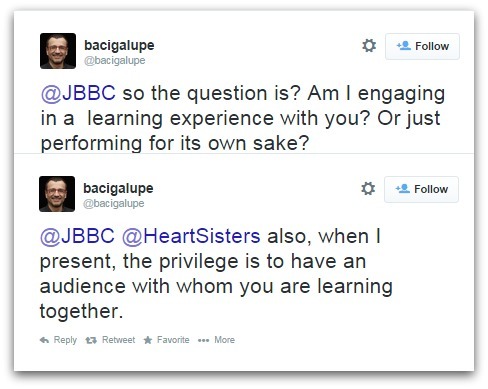 One Medicine X presenter, Professor Gonzalo Bacigalupe even live-tweeted his entire presentation, seeing it as a way to enhance collaborative learning. Live-tweeting is a way of engaging your Twitter followers by sending updates about an event as it occurs. Live-tweeters use the hashtag relevant to the event they are tweeting about (such as #MedX) which can be located on the conference’s website or Twitter profile. Twitter followers who cannot be at the event in person can follow along using the hashtag and this in turn expands the reach of the conference. Futhermore, live-tweeting is a means of amplifying the conference experience, generating international engagement and global reach and stimulating collaborative potential. With respect I do not find that live-tweeting is a barrier to absorbing what the speaker is saying. In fact, the experience of live-tweeting enhances the learning for me, helping me focus more sharply on the key details of the talk, a point also echoed in this comment by Jonathan Hausmann MD. This learning is further consolidated with an archive of tweets on which I can reflect further after the event. Sarah Chapman, whose work at the UK Cochrane Centre focuses on disseminating Cochrane evidence through social media, observes how this in-the-moment tweeting captures the immediacy and energy of the event: “Live tweeting can convey the atmosphere generated by a controversial or entertaining presentation in a way that will be lost by the time you get to look at the slides uploaded on the internet”. Many times the original tweet will be supplemented by pertinent comments on Twitter from other conference attendees and also from those listening in online. These tweets have also led to discussions which have continued after the event. Like many conferences, parallel sessions took place at Medicine X and it was of great benefit to be able to catch up on the tweets from the sessions I missed. I could speak with presenters after sessions that I didn’t attend and ask questions based on tweeted details those sessions. So for those brave souls, I offer a guide to best practice for live-tweeting your next conference, whether you are the event organizer or a delegate. 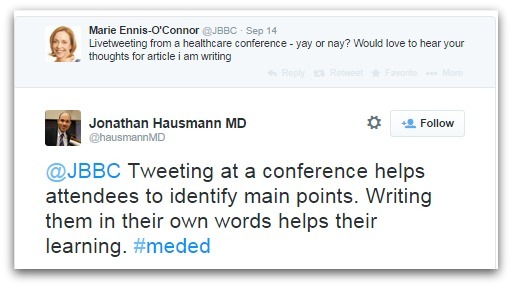 It is my opinion that all healthcare conference organizers and attendees should consider how best they might use live-tweeting to enhance shared learning and extend conference proceedings beyond the event. Success is determined by the level of engagement of conference organizers with Twitter and active encouragement of tweeting before, during, and after the meeting (Medicine X is a good example of this). What follows are my suggestions for capitalizing on live-tweeting at your next healthcare event. The first step is to create a conference hashtag (#) and let people know in advance what it will be. Ideally it should be something you can use after the event – so there is no need to include the year (i.e. #MedX not #MedX14). Your hashtag should be ready from the moment you begin promoting your event. Make it short. Remember people only have 140 characters to tweet with and you want to leave some room for re-tweets. Make it intuitive and relatable to your event but not so generic that it’s confused with something else. Make it easy to remember and type for delegates. Many will be tweeting from a smart phone or tablet. Make sure it isn’t already in use. You don’t want to duplicate an existing hashtag which may result in two simultaneous but very different conversations colliding on Twitter. Do a Twitter search to find out. Since twitter’s search history is short, expand your reach using a tool like hastags or twubs. Make sure it doesn’t have a meaning that can be misconstrued (check urban dictionary). Monitor your hashtag on a regular basis to see if someone else is using it for something unrelated. Register your hashtag with Symplur’s Healthcare Hashtag Project. Doing so will also allow you to access analytics after the event. Once you’ve decided on a hashtag, your next step is to promote it. Include the hashtag in all of your social media bios and your email signature. Tag your conference tweets, images and website with it. Display your event hashtag as a Twitter feed on your website. Print the hashtag on your conference material and include speakers’ Twitter handles on program and all delegates Twitter names on conference badges. Encourage your sponsors, exhibitors and speakers to include the hashtag in all their conference-related social media postings. Write and schedule tweets announcing speakers, reminding people to register and counting down to the event and make sure you include the conference hashtag. In the run-up to the event you may be too busy to tweet regularly, so scheduling saves you time and effort (for advice on how to schedule your tweets read this article). 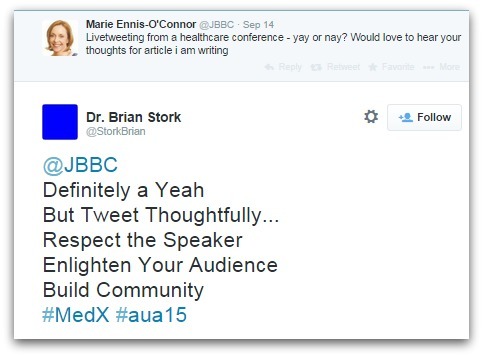 Use a tool like Canva to create template images of speakers with your event logo and conference hashtag. You can email them to speakers and encourage them to use it on their social media profiles to promote their speaking session (eg come see me speak at #MedX). Establishing a clear policy for live-tweeting at your conference is a good idea. It will help you focus on best practice, and much like a crisis communication plan, you can use it to determine in advance how to respond to problem tweets (see A Three Stage Approach For Handling A Social Media Crisis; for tips on how to block tweets from spammers click here). Make your policy available in advance to speakers so they know what to expect. Ask speakers to add their Twitter profile to their slides and if a presenter does not want their talk tweeted, this is an opportunity for them to say so. Be mindful of a speakers’ intellectual property rights (see If it’s posted, is it published? Intellectual property, conferences and social media); make it clear in your policy that you are committed to acting ethically and with integrity when it comes to respecting intellectual property. Consider adding a tweeting “code of conduct” to your conference website. This can be a simple list of suggested Dos and Don’ts and tips to help attendees tweet more professionally. Include it in delegates’ registration packs with wifi login and password details (ideally if you encourage live-tweeting your conference venue should have wifi available for delegates). For Twitter newbies, provide information on how to start a Twitter account. Designate a person (or persons) to live tweet from the event – ideally an experienced Twitter user. Provide them with your live-tweeting policy, a list of speakers’ Twitter names, affiliations and links to their websites and blogs. Give them good access to the stage for live-tweeting photos and sufficient power supplies and chargers as back-up. It’s show time. The following tips will help you live-tweet more professionally and effectively. They are aimed at all conference delegates. Additional tips are provided for the designated conference live-tweeter. Tag your tweets with the designated conference hashtag (#); let your followers know the meaning of the hashtag and why you are tweeting from the conference. Avoid the temptation to provide a blow-by-blow account. Focus on value and meaning in your tweets. Consider if people really want to see a tweeted photo of a half-empty conference room. Don’t mindlessly re-tweet what everyone else is already tweeting, unless you can add a unique perspective. Tweet links to websites, studies, or other information which will enhance understanding of the topic (but don’t spam). Don’t “binge tweet”; be selective, share key points only and avoid flooding your timeline with tweets. When live-Tweeting, one Tweet every 10 minutes is a good rule of thumb. Let your followers know in advance that you are live tweeting so they can mute the hashtag if they aren’t interested in those tweets. Choose some key quotes and statistics to share; people love to read and re-tweet quotes and stats. Be sure to attribute quotes to the speaker who made them, by using quotation marks. Whenever you cite a speaker, add their Twitter handle (and affiliation if known). Highlight new discoveries, research, publications, or collaborations in your tweets. However please don’t do so if the presenter has made it clear they do not want their work tweeted. It’s best not to take/tweet photos of large groups, unless you ask the permission of all involved. It’s ok to be constructively critical, but don’t be needlessly negative in your tweets. Don’t tweet in a vacuum; engage with fellow live tweeters and contribute to a larger conversation. Be human. Don’t keep your head buried in your laptop or tablet. Remember to look up from your device and watch the presenter from time to time. This is not just a courtesy to the speaker it is also an opportunity for you to practice the art of undivided attention. Be social. Don’t restrict yourself to tweeting behind a screen; seize the opportunity to network and meet new people face-to-face too. Live-tweeting is a great way to meet like-minded people, so use it to organize “tweetups” at coffee and lunch breaks during the event, or dinner in the evening to further the connection. Use a Twitter client to set up a saved search of the conference hashtag and @usernames. A client like TweetDeeck or HootSuite will allow you to have multiple columns open for different Twitter searches, allowing you to keep track of multiple sessions. It’s important to watch it and respond to people when they use it, especially if they’re asking questions. Sometimes, people tweet using hashtags that make sense to them instead of using the official hashtag. This shouldn’t be an issue if you have promoted your hashtag in advance, but it won’t hurt to keep an eye out for rogue hashtags and direct the users to the official one. People will use the hashtag to ask questions (what room is Session X in?) or alert organizers to a problem (lights not working in Room 3). Respond immediately to anything raised in real time, even if it is only to say you will get back later with an answer (and make sure you do). Use the hashtag to tweet announcements such as alterations to the program or room changes. It is also your responsibility to deal with any criticism and negative comments appropriately (this is where your live-tweeting policy comes into play). Don’t forget to respond to positive comments too with a polite thank you or a re-tweet. Ask your followers questions like “what’s been your favorite talk? “ or “what key thing have you learned so far?” to boost engagement. If your conference involves a question and answer session, do ask for questions from people ‘watching’ at home. This serves to increase the conference’s reach. Help session chairs to facilitate this by relaying these questions to them. Consider displaying your hashtag on a screen so that your audience can view the related tweets in real time. There are many tweet wall apps and software to choose from, some of which are free and even open source; paid options offer more customization like moderating spam tweets. Be mindful though that some people can find these a further distraction. So your event is over but your use of Twitter doesn’t end just yet. Now comes the time to consolidate your efforts and build on your success. Analyse tweets for feedback on which speakers and topics resonated with the audience, how attendees rated the physical environment (temperature of room, layout, sound, lighting, etc), catering, hospitality, parking, and any other details which will help you make your next event even better. Speakers may also gain valuable feedback from reading conference tweets to help them prepare for their next talk. It can also be an opportunity to follow up with conference attendees to answer questions, clarify information and expand on discussion initiated via Twitter. Consider too how you can use it to increase networking opportunities and further collaboration. Pull the conference tweets together into a coherent narrative with a tool like Storify. Publish it on your website and let delegates know it’s available. Check Symplur for data analytics. Symplur will provide you with visually appealing and informative graphs which you can publish on your website. Consider sending them to sponsors, exhibitors, speakers and delegates as “social proof” of your event. Highlight main conference themes in a follow-up blog post(s) on your website. Embed some tweets to illustrate your points (use a mixture of your own and attendees’) and tweet a link to any blogs that mention the conference. Don’t stop interacting with your Twitter audience. Respond to post-conference feed-back; tweet links to session recordings, blog posts, and slides. Keep the conversation going throughout the year; Medicine X hosts weekly Google Hangouts and Twitter chats in the months leading up to its conference. It’s possible to keep the momentum you’ve created going and by whetting people’s appetite you should be able to entice even more people to attend your next conference. The digital age challenges the temporality of healthcare conference limited to a select group of attendees. Live-tweeting is the new way to socialize your event, increase participation, enhance communication between attendees, share knowledge and expand community. With virtual attendees set to outnumber in-person delegates, the needs of the online majority must be met in the future. However, there is a world of difference between doing it and doing it well. By putting into practice today’s tips you and your Twitter followers can add more value to the live-tweeting experience.